Apply EBS patches while users are still entering transactions and using the E-Business Suite. Online Patching uses the Oracle Database’s Edition-Based Redefinition feature and other new technologies to allow the E-Business Suite to be updated while the system is still running. You can learn more about Online Patching via our official documentation and this technical webcast. Uses Oracle WebLogic Server, which replaces the Oracle Containers for Java (OC4J) application server used in EBS 12.0 and 12.1. You can learn more about how this improves the system administration experience via our official documentation and this technical webcast. Option for installing EBS 12.2 on to existing database servers. Capability of installation into existing Real Application Clusters environments. Database deployment on Automatic Storage Management (ASM) and other file systems. Is there a direct upgrade path from EBS 11i to 12.2? Yes, there is a direct upgrade path from EBS 11.5.10.2 to EBS 12.2. EBS 11.5.10.2 customers do not have to install an intermediary EBS 12 release (such as 12.1.3) before upgrading to EBS 12.2. EBS 11.5.10.2 customers must have applied the minimum baseline patch requirements for Extended Support as described in Patch Requirements for Extended Support of Oracle E-Business Suite Release 11.5.10 (Document 883202.1). Customers on earlier EBS 11i releases (such as 11.5.7) need to be at the 11.5.10.2 level plus the minimum baseline patch requirements for Extended Support before they can upgrade to EBS 12.2. Is there a direct upgrade path from EBS 12.0 to 12.2? Yes, there is a direct upgrade path from EBS 12.0.4 and 12.0.6 to EBS 12.2. EBS 12.0.4 or 12.0.6 customers do not have to install an intermediary EBS 12 release (such as 12.1.3) before upgrading to EBS 12.2. Customers on earlier EBS 12.0 releases (such as 12.0.3) will need to be at the 12.0.4 or 12.0.6 level before they can upgrade to EBS 12.2. Is there a direct upgrade path from EBS 12.1 to 12.2? Yes, there is a direct upgrade path from EBS 12.1.1, 12.1.2, and 12.1.3 to EBS 12.2. How can I prepare for EBS 12.2? (MLS) is a feature in Oracle E-Business (EBS) Suite of applications that enables users to run their applications in many different languages. MLS has opened the doors for global rollout of Oracle EBS with users in different countries able to use the application in their own language at the same time. Multi Language patches can be applied in Oracle as per the metalink note, R11i / R12 : Requesting Translation Synchronization Patches (Doc ID 252422.1). This metalink note has got references to other notes for applying NLS patches. National Language Support (NLS) refers to the ability of Oracle EBS to run in any one of the supported languages other than American English. However, MLS refers to the ability in which the instance can be run in as many as languages as are supported at the same time. Once MLS patches have been applied in Oracle by the DBAs the developers have to keep a few more points in mind while developing custom components. If the value of INSTALLED_FLAG is I then that language has been installed. If the value of INSTALLED_FLAG is B then it is the base language. By default, language_code is US is the base language. The Translated tables (*_TL) contain one record for each language i.e the translated string for each language. Hence the view FND_CONCURRENT_PROGRAMS_VL will return rows as per the session language settings. If queries are executed from SQL*Plus on the _VL views without setting the session language then no rows will be returned. This is explained in this article. If we query for concurrent_program_id, 20125, i.e. the program named Trial Balance, from the table FND_CONCURRENT_PROGRAMS_TLwe get the program name in all installed languages. Querying the same concurrent_program_id from the corresponding _VL view, FND_CONCURRENT_PROGRAMS_VL gives us only 1 record. A list of general guidelines has been drawn up for developing technical components which will be display more than 1 language. All user message (labels/pop ups) are to be derived from translation tables or from fnd message. After the MLS patches have been applied open the Messages form. Query for the seeded message named, ABORT. Notice that the same message has been ported into as many messages as there are installed languages. The value has also been translated. Thus if a piece of code picks up the message text from a message it will only have pick up the message text based on the language and the code need not be changed at all. An example of this incorrect usage is demonstrated here. Each report will have as many templates as the number of languages it is expected to run on. No business logic required to display template associate with language. It is configured in Oracle. The developer is allowed to upload as many translatable files as there are installed languages in Oracle. In this example there are 6 different language translations for a single template. In this case there is no need to have a separate translation file. To include different character sets into an Oracle table we have to specify the character set in the control file. Once the MLS patches have been applied to Oracle a set of directories are created in Unix under reports, forms, etc directories with the 2 character language code. The point to keep in mind here is that any custom component created with specific changes for a language must be dropped to the language specific directory. All translatable files reside in a subdirectory which has the language code incorporated in the name (e.g. $AP_TOP/reports/EL, $GL_TOP/forms/F etc.) . Now there is 1 directory to keep the same form in a different language. It is the same in all the seeded top directories, e.g. GL_TOP, AP_TOP, etc. Many Oracle functions have MLS versions. The versions are listed below. Once the MLS patches were applied on a particular Oracle instance a DFF value started throwing errors. The error is displayed below. The value ROW for value set ****** OE Shipment Priority occurs in more than one row in column LOOKUP_CODE of table FND_LOOKUP_VALUES and duplicate values are not allowed. Please choose a different value or contact your system administrator. The LOV associated with the DFF segment has not been correctly coded with regards to translations. If we look into the value set definition for the DFF segment we find that the LOV is based on the table, FND_LOOKUP_VALUES. As the Oracle instance now has MLS patches the table FND_LOOKUP_VALUES now can contain the same values across languages. We have 2 options to overcome the error faced by the user. When needed one and the same profile option can be assigned to different levels. For example, when you implement Global Security Profiles to create access control on Operation Units – every responsibility for an Operating Unit may need a setting for profile options MO: Security Profile and HR: Security Profile. In the form which is used to set profile options all those different responsibilities can’t be seen at once. In that case I use the SQL statement below to quickly provide me a list of the values of a profile option for all levels. The profile option name (column profile_option_name from table applsys.fnd_profile_options) can be found within the definition of the profile itself through responsibility Application Developer – menu Profile. Here’s the SQL to provide you the values on all levels of a specific profile. Categories are the method by which the items in inventory can be separated logically and functionally for planning, purchasing and other activities.You can use categories and category sets to group your items for various reports and programs. A category is a logical classification of items that have similar characteristics. A category set is a distinct grouping scheme and consists of categories. The flexibility of category sets allows you to report and inquire on items in a way that best suits your needs. 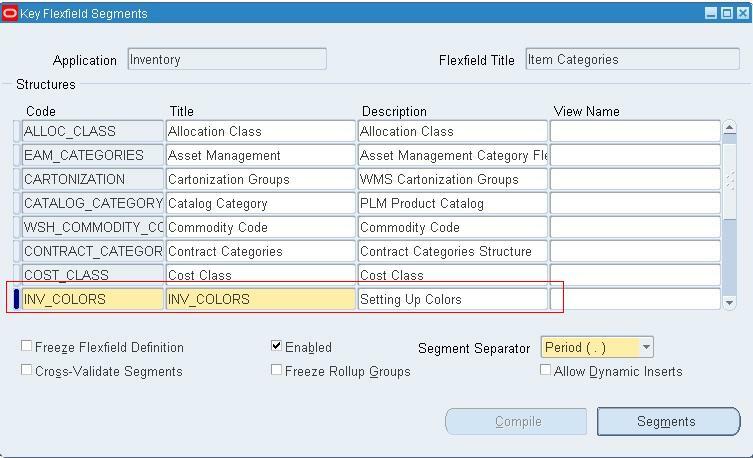 This article will describe how to create categories and category set in oracle inventory. Suppose we need a category called ‘INV_COLORS’. We can define multiple colors in this category and then assign this category to an item. 1] First we need to create a value set to hold these colors. Save and close the Screen. 4] Click on the “Segments” button. 5] Check the Freeze flex field Definition, the following warning will appear. 6] The “Compile” button is now available to be selected. Click on the compile button. 7] Go to View -> Request and Verify that the new Category flexfield compiled successfully. 8] The new structure is ready for use. Now let’s create a category. 9] Next we create our category set. 10] After creating the category set, we can assign it to any items.